Agnes R. Cacciola (nee DeLuca), 87 of Tappan passed away on , Thursday, November 22 after a long illness which she bravely fought. Agnes was born on October 11, 1931 in Binghamton, New York to Antonio and Josephine (nee DeBella) DeLuca. She was the wife of the late Agatino Cacciola and mother to Camille Paolino of Chatham, NJ, and Joseph Cacciola and his wife Sandra of Wilbraham, MA. 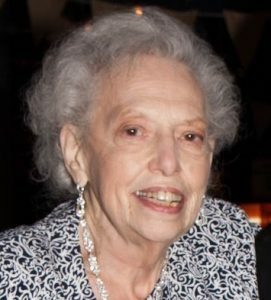 She enjoyed and cherished her time with her grandchildren, Jenna Morin and husband David, Nicholas Charles and husband Arthur, Paul Cacciola and wife Jordan, and Jamie Paolino. She is also survived by her brother, Joseph DeLuca, his companion Marie and family, and brother-in-law Daniel and wife Nancy, along with many other nieces, nephews and cousins. Agnes was employed in Orangetown School District and then by Lamont Doherty Geological Observatory of Palisades, NY, for 22 years. She was the past president of the Romanesque Lodge # 2198 from 1983 to 1985, as well as a proud member for 45 years. She was also a member of the Orangetown Seniors, the Order Sons of Italy, and the Catholic Daughters of America, serving in several positions. Visiting hours are scheduled at the Pizzi Funeral Home, Northvale, NJ, on Wednesday from 3 to 6 PM. A Mass of Christian Burial will be held at Our Lady of the Sacred Heart Church in Tappan, NY at 10 AM on Thursday. Entombment will follow at the Garden of Memories, Washington Twp, N.J. In lieu of flowers donations can be made in Agnes’ name to United Hospice of Rockland (www.hospiceofrockland.org).